The week before Xmas, J Mascis visited town. 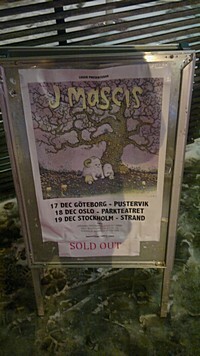 In a year where he released the very fine second solo album, Tied To a Star, J Mascis' 2014 tour of Europe reached Oslo. His second last show of Europe landed him at Oslo's brilliant venue Parkteatret. The night after Stockholm, Sweden, and the night before Göteborg (Gothenburg), Sweden. Then he went home (to Amherst) for a short holiday, I guess, before starting the year touring the UK - kicking off this week, in a couple of days. J is sort of a mystery man. He seems shy, and he for sure is a man of few words. However, when he straps on a guitar and starts singing, the magic starts. This tour was a solo show as a one-man-band. Only J plus his two Gibson acoustic guitars. But, mind you: Even though there is an aging, grey haired man sitting on a chair with an acoustic guitar eyes closed, it never get quiet and cosy. When J is armed (with boxes and pedals), he sure makes a pretty noise. There is fuzz, there is distortion, and there is a lot of guitar. This tour is of course mainly presenting the songs from his recent album, Tied To a Star. He kicks off with "Listen to Me" (from Several Shades of Why), followed by "Me Again", and, yes, it is as if he is in his own world. This whole, little set could have been going on in his private rehearsal boot, probably in his living room, or down in some basement. Even if it is a calm evening, with rather quiet songs the man himself is electric. Yet, he is dead calm, laidback and totally relaxed. It doesn't look like he's moving a muscle if he doesn't need to do so. And, of course, all the time he is in a variation of scuzzy-punk and/or singer/songwriter mode. "Every Morning" is as triumphant as it is on the album, even though J played it faster than I thought he'd manage. I was wrong, and the song came out perfect. "Heal the Star" was served with a spaced out raga intro and outro. He presented "Wide Awake", "Stumble", "Drifter", and a massive, epic version "Heal the Star". Now and again he took a dive and dipped into Dino-land, playing several versions of Dinosaur Jr songs. He did "Out There" and "Not the Same" (both from Where You Been), and he did "Little Fury Things" (off You're Living All Over Me). Of course he played the Mazzy Star cover "Fade Into You", and he did J Mascis + The Fog song "Ammaring" (from More Light). Throughout the night the songs where filled with classic J guitar, and his trademark sound and solos. He did not say much (probably some 10-12 words during the show), Instead he let the guitar do the talking. A phenomenal "Alone" (Dinosaur Jr., from Hand it Over), and the sound of that song was the speed of the sound of loneliness. Then he mumbled 'Alright, yeah...', and left the stage. But, yes, he returned for an encore of one song: "Just Like Heaven". It was quite a surprise, but it seems like he is closing all his shows with this legendary cover of The Cure. It was frantic, wild, and most of the audience - a bunch of hard-core fans - could have, and would have followed J to heaven, I guess. 'See you next time, guys!' J keeps it short and simple. I don't know which star J is attached to, or is dragged towards, or sits on. It is for sure not the second star to the left. J and his songs make a very different star. Merry Xmas, Mr Mascis, and a happy new year. As you tour on. Forever, and beyond. In this year of 2015, when he turns 50 in December. You may also want to check out our J Mascis articles/reviews: Every Morning, Several Shades of Why, Tied to a Star.